From the Hot Wheels collection by Mattel. Hot Wheels Hauling Rig Vehicle. This Item is in stock and ready to ship. 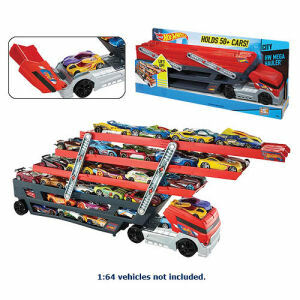 You should not postpone your purchase and miss out on adding Hot Wheels Hauling Rig Vehicle to your Hot Wheels collection! From the Hot Wheels collection by Mattel. Hot Wheels Hauling Rig Vehicle. This massive hauler can be loaded with more than 50 cars in its 6 expandable levels. Measures 18 inches long.